Lens Description: The Schneider 480mm f/8.4 Apo-Symmar L Lens is an all-purpose large format lens which gives the highest image reproduction quality possible in a broad range of applications. This lens is designed for use with 8x10 cameras as a telephoto lens, but can also be used upon the 11x14 ultra large format as a standard lens. 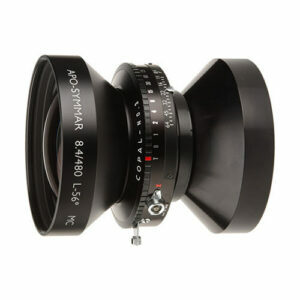 This lens is enormous, with a 110mm rear barrel, and as such is designed primarily for use with larger view cameras as opposed to field cameras.